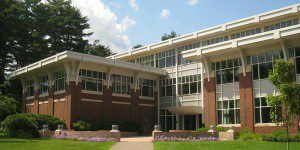 The 21-month Babson College full-time MBA—also known as the Two Year MBA—at the F.W. Olin Graduate School of Business is a flexible program that takes into account students’ individual goals. There is one full-time MBA intake per year, and students enter in August. Students must complete 55 credits in order to earn the Babson College full-time MBA. All students must complete four eight-week modules during the first year before undertaking elective study in their second year. Modules focus on 3 to 4 academic “streams” (subjects) and include signature learning experiences (SLEs) or experiential opportunities that allow students to apply information from their courses to practical business problems. Module I consists of courses in the four streams of: Entrepreneurship & Opportunity; Strategy; Financial Reporting; and Data, Models and Decisions. The SLEs included in this module focus on the themes of creating, team building and feasibility analysis. The second module focuses on marketing, managerial economics, an introduction to financial management, and law. Module II’s SLE emphasis is demand sizing and forecasting, market segmentation and price discrimination and socially responsible managerial decision-making. Before the third module in the spring, students must complete a one-credit “spring kickoff” course Managing Talent: Your Own and Others. The third module’s streams emphasize creating and leading effective organizations, measuring and managing strategic performance, technology and operations management, and the BCAP capstone unit. Module IV has an international focus. Academic streams include: Managing at the Crossroads: Business; Government and the International Economy; Global Connections through Technology; and a continuation of the BCAP capstone project. Students must complete one elective, worth three credits, in their first spring semester. The rest of the curriculum is devoted to elective courses, and second-year offerings comprise traditional and non-traditional elective courses. Traditional electives are offered through the accounting and law, finance, economics, technology, operations and information management, entrepreneurship, marketing, and management departments. Non-traditional electives consist of study abroad opportunities, research and team projects. Students may take courses abroad through Babson or partner schools, conduct research or participate in the Management Consulting Field Experience (MCFE) or Joint Management Consulting Field Experience (JMCFE). The Global Management Program is another option, allowing MBA candidates to work and study abroad. Babson runs 15 graduate programs in more than 15 countries and maintains relationships with -partner schools throughout Europe and China. Students may also pursue a concentration in order to organize their elective studies, and each concentration necessitates the completion of 9-12 credits in one of the following five areas: Business Analytics; Entrepreneurship; Finance; Global Management; and Marketing. The most recent Babson College full-time MBA class consisted of 158 total students, 33 percent of which identified as female. Overall, 80 percent of students were considered international. Students entered the program with an average GPA of 3.2, 5.4 years of professional work experience, and an average GMAT of 619. About 82 percent of the most recent graduating class were employed within three months of graduation from the Babson College Two-Year Full-Time MBA. The average base salary posted by 2017 graduates was $84,000. The top industries for graduates were financial services and technology at 20 percent each, consumer products and retail at 14 percent, manufacturing at 11 percent and real estate at 10 percent. For 2018-19, tuition for the first year of the Babson College full-time MBA is $69,520, while the second year is $43,920. Babson estimates housing costs to be $13,014 and recommends budgeting $2,252 for books and supplies, $5,784 for food, $1,936 for transportation expenses. Along with some other fees and expenses, MBA students should therefore expect to pay $97,908 in total for the first year. Students who take nine or more credit hours are required by Massachusetts law to have health insurance. Babson contracts with University Health Plans to provide coverage through Blue Cross Blue Shield. The cost for the 2018-19 academic year is $2,534. Babson does not operate a specific loan program, so the school encourages U.S. applicants to apply for federal loans by filling out the Free Application for Federal Student Aid (FAFSA). Babson offers merit and donor scholarships, assistantships and fellowships to both domestic and international applicants to the full-time program, and these scholarships are awarded to candidates at the time of admission. A variety of endowed fellowships and scholarships are also linked to the school. Students should check with the admissions office or program directors in order to determine their eligibility and availability. The full-time MBA program requires that students have completed a bachelor’s degree or equivalent. In addition to an online form, applicants should submit their official academic transcripts, a $100 application fee, two letters of recommendation, a current résumé, GMAT or GRE scores, two essays and, in the case of international candidates whose native language is not English, TOEFL iBT, or IELTS test scores. Interviews are conducted by invitation only. There is no minimum standard GMAT or GRE score needed to apply.